Pay attention to skis like Nordica's Fire Arrow. Part of a growing trend in ski manufacturing, the Fire Arrow attempts to combine the best of traditional and modern ski designs. If you've got roots in the hard snow/carving universe, a ski in this category is almost certain to end up in your quiver sooner or later. The Fire Arrow series (models 80 and 74) are skis that experiment with pairing traditionally-narrow waists with big, floaty tips and tails. You don't get a rockered profile here—camber is firmly traditional—but you do get twin-tips to "bring the fun back to the frontside." Fun in this case definitely means carving big, fast arcs on groomed snow. But is also means all-mountain versatility, thanks to the Fire Arrow's substantial surface area. The Fire Arrow's synthesis of genres delivers a ski that is very much in the Mantra cohort: a ski designed to bridge a wide range of snow conditions and turning styles. On the snow, you'll notice the Fire Arrow's sidecut (and 14.5-meter turn radius) right away. Lay the skis over on their edges, and they turn, making big, swoopy GS arcs across the fall line just how you like it. In this regard, the Fire Arrow 80 absolutely outperforms Volkl's Mantra. That short radius ensures that they always finish the turn, never sticking in the end as straighter planks sometimes do. That said, I found the Fire Arrow 80 a bit pokey in the quickness department. To the best of my recollection, the Mantra is a snappier ski, delivering a quicker feel underfoot when you shift toward a more upright, slalom-style turn. Oddly enough, I may have to give the advantage in turn shape versatility to the Mantra (those damned Mantras—they remain a hell of a ski). Note that I was specifically testing the 80mm width. I'd expect the Fire Arrow 74 to pick up a bit of edge-to-edge quickness thanks to its narrower waist. With either ski, you're getting enough width in tip and tail to make for at-least salvageable powder performance (though here too, the Mantra is likely to outperform). So let's call the Fire Arrow an All Mountain ski tilted toward groomer carving. Exactly how pleased you are with the Fire Arrow probably depends a lot on what you expect from it. If you're looking for Dynastar Course Ti carving performance, the Fire Arrow is not nearly in that caliber. 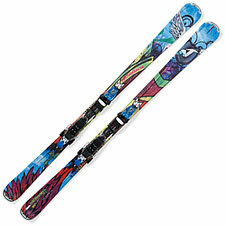 But if you're in the one-ski quiver market, the Fire Arrow offers an interesting take on the concept. The ski's short radius ensures you'll enjoy yourself on groomed runs. Twin-tips offer some park/backwards compatibility, making for a fun day all over the hill.